One of the most exciting recent developments in the study of Chaco Canyon is the increasing use of scientific analysis of artifacts and other material remains to test and challenge previous theories based more narrowly on traditional archaeology. This includes the use of radiocarbon dating, which is widely used as a basis for developing chronologies in most other parts of the world but has been underused in the Southwest due to the availability of tree-ring dating for chronology building. Particularly with the development of accelerator mass spectrometry (AMS) radiocarbon dating, which requires vastly less material than earlier methods, however, it is now possible to gain direct dates on a very wide variety of materials, including many artifact types as well as plants and human and animal bones. This allows an independent check on dating of material by association with tree-ring dated architecture and pottery, which has been the traditional approach. The increasing use of AMS on the museum collections excavated decades ago from Pueblo Bonito, in particular, is starting to lead to some unexpected and surprising conclusions. This work is largely being done by archaeologists associated with the University of Virginia led by Steve Plog, in collaboration with colleagues at many other institutions. One recent paper, about a year old now, reported some surprising results from the dating of the bones of one of the most distinctive species found at Chaco: scarlet macaws. These birds are not native to anywhere near the Southwest, and they must have been brought up from very far south in Mexico. They are disproportionately found at only a few sites in the Southwest, one of which is Pueblo Bonito. Traditionally it has been thought that the importation of macaws was associated with the “florescence” of Chaco, the roughly 100-year period starting around AD 1040 when most of the monumental great houses in the canyon were built and Chacoan influence is seen over a very large part of the northern Southwest. For this study, the researchers dated 14 macaws from Pueblo Bonito: 11 from Room 38, which had the highest concentration of macaw remains at the site, two from Room 78, and one from Room 71. Both of these latter rooms are in fairly close proximity to Room 38 within the site. They also dated four macaws from Mimbres sites in southwestern New Mexico, another area with a relatively high concentration of these birds that lies between Chaco and Mexico and thus could played a role in their procurement, and two from Grand Gulch in Utah, which is on the far fringes of the ancient Pueblo world and yet has produced a few macaw specimens. The results were surprising, and they challenge the traditional association of macaws with the Chacoan florescence. Six of the Chaco birds dated to between AD 885 and 990 (all dates given here are at 95% probability), well before the florescence and a time when Chaco would have been much less impressive architecturally. This is, however, a time when population in the canyon was increasing rapidly through immigration from various areas that were affected by the big changes at the end of the Pueblo I period, as we have seen in my recent series of posts on Pueblo I. The authors of this paper don’t mention this population movement specifically, but they do suggest that this indicates that the later period of monumental construction and other signs of sociopolitical complexity was the result of a long period of developing complexity, which fits the demographic evidence pretty well. Six other birds date between AD 970 and 1035, which would put them shortly before or possibly at the very beginning of the florescence and building boom. This suggests that trade relations with the far south continued beyond the initial period when macaws were introduced to the canyon. The final two date between AD 1015 and 1155, which suggests they probably were procured sometime during (or even shortly after) the period of florescence. Overall the dates suggest that macaws were procured throughout most of the period of Chaco’s rise from the period when Chaco was first rising to regional preeminence in the ninth and tenth centuries until its loss of preeminence (I think “collapse” is too strong a term for this still poorly understood phenomenon) in the twelfth. One thing you may have noticed about those date ranges, however, is that they all overlap. Given the statistical uncertainty of radiocarbon dates, this means that it’s possible that these dates indicate a continuous process of importation of macaws from Mesoamerica. (There is no evidence for breeding of macaws at Chaco, unlike at the later site of Casas Grandes in northern Chihuahua.) The clustering of sets of dates, however, suggests on the contrary that importation was sporadic, with possibly just three individual procurements of multiple birds at a time. And additional complication is that the shape of the radiocarbon calibration curve differs at different times through this sequence, which can lead to certain time periods being over- or under-represented in series of dates. To test these hypotheses, the authors did some simulation of random dates throughout the period in question and compared the resulting distributions with the actual distribution of macaw dates. The results were that the early cluster of dates did conform to what might be expected from the effects of the shape of the curve, the middle cluster had more dates than would be expected and the late cluster fewer. This suggests that while it is possible that procurement of macaws was a continuous process, it does appear that a larger number of birds were imported in the late tenth and early eleventh centuries than earlier or later. Of course, this is a small sample, and these apparent patterns may change with more data. As for the non-Chaco macaws, one of the Mimbres ones dated to AD 895 to 1020, straddling the first two clusters of dates at Chaco, while the other three all dated from around AD 1015 to 1155, as did the two Grand Gulch specimens. This suggests that macaws were present earlier at Chaco than in areas to either the north or south, which further suggests that at least initial importation of macaws to Chaco didn’t necessarily depend on Mimbres middlemen. Macaws have also been found at Hohokam sites in southern Arizona that appear to be in earlier contexts than the ones at Chaco, but none of these have yet been directly dated. Taken in conjunction with the evidence for regional population movement in late Pueblo I, this study provides more support for the idea that the influx of populations into the canyon in the late ninth century, some bringing ideas developed in the earlier short-lived villages to the north in Colorado, set the stage for the development of new ideas about social organization and hierarchy which may have led to new ideologies and the importation of both goods and ideas from areas far away. The fact that macaws would have to have come from the south, where the archaeology of areas immediately adjacent to the Chacoan region is much more poorly known than that of comparable areas to the north, points to the importance of developing a better understanding of those areas. We still know very little about the exact routes of trade connections to the south, even as the importance of those connections becomes increasingly apparent. The final chapter in Crucible of Pueblos offers, in the words of its title, “a synthesis of sorts.” Authored by the noted Chaco specialist John Kantner, it gives a brief chronological overview of the period covered by this book, combining the information from the other chapters to create a picture as complete as possible given current evidence. As Kantner notes several times, current evidence is very sparse for certain regions and periods, and the resulting synthesis is therefore tentative on many issues. Kantner starts with the period AD 600 to 725, which some but not all of the regional chapters cover. He focuses on the idea that this period was marked by a “Neolithic Demographic Transition” of the sort seen in other parts of the world following the adoption of agriculture. In this case he sees the catalyst for the transition not being the initial introduction of domesticated plants to the northern Southwest, which an increasing body of evidence has shown was actually much earlier, but on the idea that new varieties of maize that were introduced at this time caused a widespread shift to a farming-based lifestyle, whereas earlier cultigens had just been added into a hunting and gathering system as a minor component. This theory has been advanced by several archaeologists in recent years, and it is certainly plausible, but I think the data is still not quite there to establish it firmly. In any case, Kantner sees the immediate result of the shift to intensive agriculture being a sharp increase in population, which led at least in some areas to increases in site size (but only to slightly larger hamlets in most cases), as well as possibly to violence and warfare, as evidenced by an increasing number of stockaded hamlets. Sites were still generally quite small and loosely clustered around a variety of types of public architecture. He claims not to see much evidence of migration between regions during this period, which sounds dubious to me given how much we see later. As he acknowledges, though, the data for this early period is particularly limited, especially for less-researched areas, and it’s hard to draw any firm conclusions. His next period, AD 725 to 825, definitely does show a lot of migration, and Kantner sees that and increasing settlement aggregation as being the two major processes evidence in the archaeological record. Data gaps are an issue here as well, however, and the details of these processes are much clearer in some regions (especially the Northern San Juan/Mesa Verde area) than others. All this migration and aggregation seems to have led to increasingly ethnically diverse communities, although identifying “ethnicity” in this sort of context is tricky as material culture traits that might be used to identify groups don’t always cluster neatly. Despite this diversity, Kantner sees less evidence in this period for violence than in the previous one, at least until the very end of it when there are some spectacular examples like the apparent massacre at Sacred Ridge, which may have been ethnically motivated. Less spectacularly, the presence of defensive sites in Southeast Utah also seems to increase at the end of this period, again suggesting conflict. Interestingly, though, there seems to be little or no evidence for this sort of conflict further south, although again it’s important to note that southern regions have seen much less research. This period saw possibly the earliest examples of settlements aggregated enough to call “villages,” although Kantner notes that a large portion of the population was still living in dispersed hamlets. The question of why some but not all people chose to begin living in greater proximity is an important one that remains largely unanswered. The trends of migration and aggregation continue into Kantner’s next period, AD 825 to 880. This is especially apparent in the well-studied Central Mesa Verde region, but it appears to have continued in other areas as well, with a general trend toward settlement in well-watered areas, which may signify another episode of agricultural intensification. This is also suggested by the increased storage capacity of the new villages, some of which might indicate community-level storage of grain. Kantner notes that larger villages might also have been able to mobilize more people for hunting and therefore increased hunting success, a reminder that even a heavily emphasis on agriculture doesn’t necessarily replace all other subsistence pursuits. There also is some evidence for changes in gendered labor at this time, again likely tied to subsistence changes: greater emphasis on stored food, presumably largely in the form of cornmeal/flour, would require more time spent on particular types of processing work. This would potentially include both grinding itself and other tasks required by new ways of preparing food, especially making more pots in which the ground meal would need to be cooked. These are presumed to have been primarily female tasks, so the increased time investment in them may have affected gender roles and relations between the sexes. This is an interesting idea that I think could use more elaboration. Public architecture continues to be diverse but there are some interesting patterns in what types occur in the new villages, especially between great kivas and what Kantner (among others) calls “oversized pit structures.” He makes some suggestions about correlations between these architectural forms and other factors, such as the idea that great kivas may be associated with periods of social instability and the idea that oversized pit structures were more exclusive than great kivas but the ritual in them may have been more ostentatious, judging by the unusual deposits left behind, such as exotic animal remains and redware pottery. He notes the theory that oversized pit structures and their accompanying U-shaped roomblocks may have been associated with emerging ritual leaders, who may have competed with each other for status and power based on their increased storage capacity, access to game meat, and possibly capacity to control craft activities as well. I think there’s a lot of merit to this idea, although it does still rely quite heavily on data from the well-studied Central Mesa Verde area and new research elsewhere might complicate it. It’s worth noting again, however, that despite the many very visible and interesting changes resulting from increased aggregation a large portion of the population was still living outside of villages. How these people would have interacted with the villages and how their lives might have differed are under-studied but important questions. Kantner refers to his next and last period, starting in AD 880, as “the Dawn of Chaco,” which seems reasonable given the emerging picture. 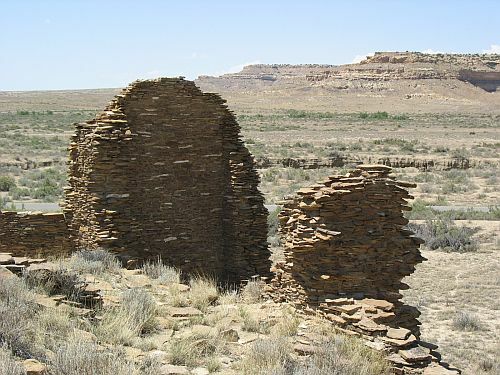 The key change at this time is the abandonment of the villages that arose in the previous period and the almost complete abandonment of the Central and Eastern Mesa Verde regions, with their residents apparently moving both west into Utah and south into New Mexico, where some of them very likely contributed to the early development of the regional center at Chaco Canyon. This may have been associated with a period of favorable rainfall in the Chaco area compared to a difficult time in the north, but the climatic details are not yet clear. Kantner notes that recent evidence has suggested that the prior population in the Chaco area was a lot smaller than had once been thought, but he also notes that there definitely was an existing population in and around Chaco, and that some sites like Pueblo Bonito were already established before this migration. This population seems to have had ties to the south and was likely different ethnically from the people moving in from the north. There is some evidence for violence that might have accompanied the initial stages of the migration, but it appears that the groups reached an accommodation of some sort over time that led to the development and florescence of the Chaco Phenomenon over the next three centuries. Kantner suggests that the instability of the early period, and possible inequities between the groups, may have contributed to this process of “social elaboration,” which is another interesting idea meriting further study. There are some clear continuities in architecture between the earlier villages and the communities that developed at Chaco, but the question of what had changed to make Chaco so much more successful and long-lived than the northern villages remains open. In closing, Kantner reiterates some of the caveats he has mentioned before about interpreting this emerging picture. Why didn’t everyone join villages? This seems like a particularly important question to me, and one that has not received enough attention in the development of aggregation models. It’s a particular problem for models that emphasis “push” factors like the need for defense in an increasingly crowded landscape, though Kantner suggests that this may have been a bigger factor for immigrant groups entering a potentially hostile new area than for the indigenous groups they encountered. He has more discussion of “pull” factors, such as economies of scale for intensified work on activities like farming, hunting, and craft production, but ultimately suggests that a complex combination of pushes and pulls may account for the notable variation in village forms that we see throughout this period. Another important question is why these early villages failed. Kantner suggests changes in the above-mentioned balance of push/pull factors, as well as the possibility that aggregation created its own new problems and stresses on the emerging social systems. Whatever the details, it seems increasingly clear that the lessons from the complicated processes covered by this book formed the basis for the later emergence of Chaco and the immense changes in the Pueblo world that it would entail. Chapter 11 of Crucible of Pueblos, by Rich Wilshusen, Scott Ortman, and Ann Phillips, is called “Processions, Leaders, and Gathering Places,” but I think a more concise description of its main concern is ideology. Specifically, this chapter looks at changes in the ideology of leadership, power, and community organization during the Basketmaker III and Pueblo I periods, as seen through the archaeology of public architecture, the portrayal of processions in rock art, and the reconstruction of related vocabulary through comparative linguistics. Due to this innovative interdisciplinary approach, I found this one of the most interesting chapters in the book. Some of the argumentation and conclusions strike me as either weak or overly speculative, but overall this is a fascinating example of how approaches from very different disciplines can be skillfully combined to produce a more complete picture of the past. The overall settlement pattern shifted from dispersed hamlets to aggregated villages. The locations for occasional ritual gatherings shifted from symbolically important central locations with public architecture to specific locations within villages that in some cases were likely residences of village leaders who exerted control over rituals they hosted. The social ties that sustained communities shifted from personal relationships between individuals to symbolic relationships between abstract corporate entities to which individuals belonged. The authors see all of these shifts as being ultimately driven by the rapid increase in population from an intensification of agriculture (the so-called “Neolithic Demographic Transition”). The actual evidence for this transition, and its relationship to agriculture, seems a bit thin to me, but at least on a theoretical level it makes sense, and there’s certainly no question that populations were increasing rapidly in the Mesa Verde region (to which this chapter, like several others, essentially confines itself due to the scarcity of comparable data for other areas) during the period they discuss. From archaeology, the most important shift the authors discuss is the well-known change from dispersed settlements during Basketmaker III to aggregated villages in Pueblo I. (Again, we’re essentially just looking at the greater Mesa Verde area here, without any discussion of the possible Basketmaker III villages at Chaco Canyon.) One aspect of the Basketmaker III settlement pattern that is particularly important is the presence of “isolated” public architecture of presumed ritual function, which in some cases took the form of “great kivas” and in other cases took the form of “dance circles,” the main distinction being whether the structure appears to have had a roof. These structures are generally thought to have hosted occasional rituals that brought in people from throughout the surrounding area and helped to integrate them as a social “community.” In addition to the actual rituals performed, about which we know little to nothing, these events would have provided opportunities to trade, share information, and find marriage partners, all important activities to ensuring the success of the community and its members. So far so good, and this is about as far as the archaeology can take us. These ideas are plausible, but they’re not new. Where this chapter goes further than others, however, is in incorporating evidence from rock art as well. The specific focus is on rock art depicting what appear to be ritual processions. The authors analyze two specific panels in detail. One, from Comb Ridge in southern Utah, is thought to date to the Basketmaker III period and to depict the sort of gathering of dispersed communities at a central ritual site that was argued above to have been typical of this period. The other panel is from near Waterflow in northwestern New Mexico, and it is argued to date to later, after the collapse of the Pueblo I villages in the Central Mesa Verde region but before the rise of Chaco to the south. This site is at a key point along what may have been one of the main routes between those two areas, which may be important. I won’t go into much detail about the analyses of the two panels, interesting though they are. The main points are that the Comb Ridge appears to depict at least two groups approaching a round great kiva or dance circle site from different directions, possibly reflecting the joining of two previously separate communities into one. The focus is on long lines of human figures, some of which have elaborate regalia or carry possible ritual objects, which may indicate that they represent specific individuals. Referring to an earlier study, the authors suggest that the focus on these rituals in Basketmaker III rock art represents a shift in ideology from earlier Basketmaker II art that focused on life-cycle rituals and individualistic shamanism to a more communal type of ritual associated with the central sites. There is very little rock art associated with the Pueblo I villages, and no known procession scenes at all. The authors don’t discuss this fact in any detail, but it seems significant as evidence for a shift in ideology associated with the new ritual forms they describe as indicated by the architecture. Yet another shift appears to be indicated by the reappearance of procession scenes during the Pueblo I/Pueblo II transition as represented by the Waterflow panel. Here, the procession is primarily of animals rather than people, and they are approaching a square divided into halves and decorated with abstract designs. The whole panel has much more of an abstract feel, and it includes symbols of authority known from later Pueblo religion such as twin mountain lions who appear to be guarding the square. The authors interpret the square as representing the community, with the animals approaching it possibly being symbols of corporate groups like clans that make it up rather than known individuals. Of particular interest, the authors suggest on the basis of other rock art evidence that the symbols on the square actually represent a specific community, as there are apparently other symbols like this with various abstract symbols that may depict community in a sort of “heraldry” comparable to the city glyphs known from Mesoamerica. There are also intriguing petroglyphs of human figures with these squares as heads, possibly indicating village “heads” or chiefs. This system doesn’t appear to continue into later periods, at least in this form, though it may be worth taking another look at distinctive rock art motifs found at later sites to see if there is any continuity in the symbolism. The so-called “blanket” motifs found in rock art at Chaco are similar at least in form. So the overall picture from the rock art evidence is of a shift from showing communities as consisting of groups of individual people who gather at a central location on certain occasions to more abstract depictions of communities as consisting of social categories, rather than individuals. This may reflect a further step in the development of community ideology after the first, apparently failed, experiments with village living during Pueblo I. The elaborate system that developed subsequently at Chaco may have been yet another step. Turning to language, this is a particularly interesting part of the chapter for me given my linguistic background. It is based on Ortman’s dissertation, subsequently turned into a book, which considered linguistics along with other lines of evidence to understand the cultural makeup of the Mesa Verde region in the later Pueblo III period. While several languages from different families are spoken by the modern Pueblos, here the discussion is limited to the Kiowa-Tanoan language family, the only family that is both primarily spoken by Puebloan peoples and complex enough in structure to analyze historically in any detail. The analysis is based on what terms for culturally important items and technologies can be reconstructed to different stages of the language, and how the presence or absence of certain terms relates to when they were introduced in the archaeological record. So, for example, the (Puebloan) Tanoan languages share some terms related to agriculture with the (non-Puebloan) Kiowa language, but lack shared terms for such items as pottery, beans, and the bow and arrow. Since these items were introduced to the northern Southwest in the Basketmaker III period, it appears that Kiowa broke off from the other languages no later than Basketmaker II. The subsequent divisions within Tanoan look a lot shakier to me, but if they do hold up they seem to indicate that the Towa language split off during Basketmaker III, which would have left the language ancestral to Tiwa and Tewa as having been spoken during Pueblo I, possibly in some of the early villages of the Mesa Verde region. Tiwa and Tewa are said to have split after Pueblo I, which the authors of this chapter suggest indicates that it was the collapse of those villages that caused the split. This is an interesting approach to trying to align the linguistic and archaeological records, and I’m glad people are looking at it. It doesn’t seem to add much to the other two lines of evidence in this specific case, however, and there are some potential issues that make it hard to apply in general. For one, it can be hard to tell if the inability to reconstruct a term to a given protolanguage truly indicates that the item it represents was not present during the period when that protolanguage was spoken, especially in a small language like Kiowa-Tanoan. Terms can be lost in daughter languages in many ways, with the ultimate result being the same in the present language as if it had never existed. However, this is a much more productive approach to the problem of correlating linguistics with archaeology than some others that have been tried, like glottochronology, and it’s definitely worth pursuing to see what insights it can provide. Another problem, however, is that there are several other Pueblo languages not related to Kiowa-Tanoan, and this type of analysis doesn’t, and can’t, say anything about when and where they might have been spoken. A better approach to try to address the diversity of languages among the Pueblos is to look at loanwords, both between different Pueblo languages and between them and non-Pueblo ones, and try to see what can be inferred about when certain items were introduced to speakers of a given language based on that. There have been some studies along these lines that have given some interesting insights and more work would be useful. Overall, this chapter is a really interesting approach to trying to correlate different types of analyses to complement each other and get a better answer to a specific question about the past than any one type of analysis individually. At the end the authors call for more work like this, and I second that call. The specific conclusions arrived at in this publication may or may not hold up under further study, but the process it demonstrates for getting them will be helpful in moving forward and getting more complete and reliable answers. 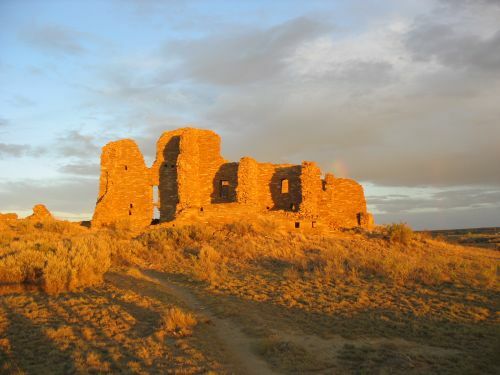 Chapter five of Crucible of Pueblos brings us to Chaco Canyon and the surrounding area. This is an area of particular interest for me, and I presume for most readers of this blog as well. While the rise of Chaco in the tenth and early eleventh centuries AD was clearly a development rooted in earlier events, there has long been less information available for the area of Chaco itself than for the areas to the north that have seen extensive relatively recent excavations of sites dating to the Pueblo I period. The Pueblo I occupations of those areas, the subjects of the earlier chapters in this book, are now fairly well understood, although there of course remain a lot of questions and gaps to fill. Further south the picture is still much murkier. This chapter is written by prominent Chaco specialists Tom Windes and Ruth Van Dyke, and is particularly important and useful because it includes the first published synthesis of the work Windes has been doing for many years to identify sites in and around Chaco dating to the Pueblo I period. This work was written up as part of the series of reports on the work of the Chaco Project, but that report, dated 2006, remains unpublished. I presume that this is a deliberate decision on the part of the National Park Service to keep sensitive information on site locations from becoming public (although I don’t actually know for sure). This chapter, then, appears to serve as the published record of this important work, which significantly alters the conventional interpretation of Pueblo I in Chaco. The authors define their geographic scope as what they call the “Chaco Basin,” which is essentially equivalent to what is commonly know in the Chaco literature as the “San Juan Basin.” I think this is a useful change to the terminology, since “San Juan Basin” in the hydrographic sense refers to a much larger area than it is used for in this context, and while some use terms like “San Juan Physiographic Basin” to clarify this, it’s more straightforward to redefine the area and use a new term. 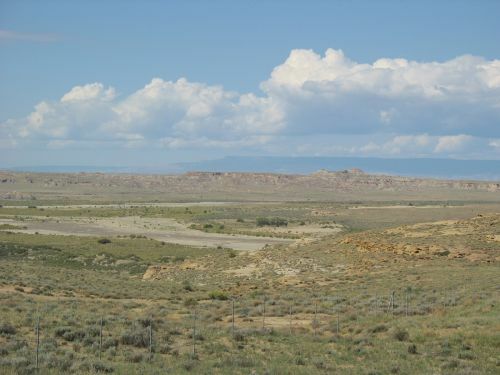 “Chaco Basin” is a good term to use because the area more or less corresponds to the drainage basin of the Chaco River, including its tributaries, although it extends a bit beyond to the east and south into the Puerco Valley and Red Mesa Valley respectively. However it’s labeled, this region is roughly bounded by the San Juan River to the north, the Chuska Mountains to the west, the Zuni Mountains to the south, and the Jemez Mountains to the east. Temporally, the authors restrict their attention in this chapter to the period from AD 700 to 925, unlike some other authors in this volume who also address the preceding Basketmaker III period. This is understandable but in some ways unfortunate, since there was an important Basketmaker III occupation of Chaco Canyon that was likely important in setting the context for Pueblo I developments, just as those developments were important in setting the context for Pueblo II. Confusingly, they use the term “Pueblo I” for sites dating from AD 700 to 875 and “late Pueblo I” for sites dating from AD 875 to 925. As we’ll see below, the distinction between these two periods is important in this region, as population and settlement patterns changed significantly at around AD 875. The specific terms they use still seem odd and liable to cause confusion, however. Part of the reason the authors argue that the Pueblo I occupation in this region is poorly understood is that the ceramic chronology is different from that of the better-known sites to the north, and using the same types to identify time periods for sites in both regions leads to problems. They carefully define the types they use to identify sites to time period, and also use architectural criteria (which are however difficult to apply to unexcavated sites). Most of this chapter is a summary of what is known about Pueblo I settlement in each subregion of the Chaco Basin, based in large part on hitherto unpublished fieldwork. As a result, I will structure this post according to the same subregions in the same order and summarize the information on each. The heading for this section says “Northwestern” rather than “Northeastern,” but it’s clear from the text that this in error. These areas, north and northeast of the Chaco River but still within the drainage of the San Juan, were sparsely populated throughout the Pueblo period. Windes and Van Dyke note that the Largo and Gobernador canyons, to the northeast of Chaco, may have served as conduits for populations migrating south from the Mesa Verde region into the Chaco Basin in late Pueblo I. A recently discovered village at the confluence of Largo and Blanco Washes included a great kiva and at least 22 habitation sites, with tree-ring dates from the great kiva pointing to construction at about AD 828. This area is roughly due south of the Cedar Hill and Ridges Basin areas of the Animas Valley, considered part of the Eastern Mesa Verde region in this volume, which had extensive but short-lived populations early in Pueblo I. The tree-ring dates from the Largo-Blanco village suggest that it may have been associated with the initial migration out of the Ridges Basin/Durango area in the early 800s rather than the larger migration in the late 800s. The Chaco River may have been another conduit for migrants from the north, as Windes and Van Dyke note that surveys have found a major increase in sites dating to the late 800s along the east side of the Chaco, compared to a virtual absense of sites for earlier in Pueblo I. This will be a recurring pattern in the region. The initial survey work of the Chaco Project in the 1970s identified a fairly extensive Pueblo I occupation in and around the canyon, and publications from that time posited a gradual increase in population over the course of Pueblo I leading up to the florescence of Chaco as a regional center in Pueblo II. Based on his more recent work with ceramic classification and dating, however, Windes disputes this account. He argues that the number of sites assigned to Pueblo I in those surveys is vastly inflated, and that for most of the Pueblo I period the Chaco area had a small population which increased dramatically, presumably due largely to immigration, in the late Pueblo I period. In this chapter Windes and Van Dyke (though clearly this part is mostly Windes) summarize the results of Windes’s reevaluations of the Pueblo I occupation in and around the canyon, moving from east to west. 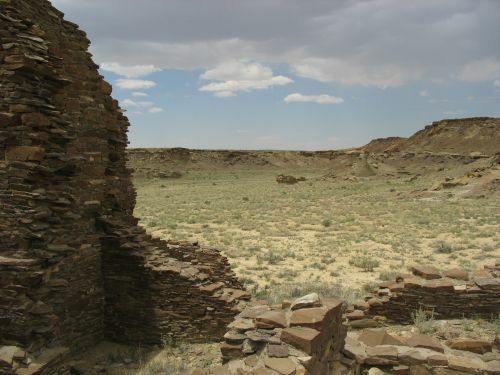 At the east end of Chaco Canyon, the Pueblo Pintado area was apparently unoccupied until about AD 875, when it was colonized by two groups who had markedly different material culture and appear to have come to the canyon from different directions. They formed separate site clusters about 3 km apart, north and west of the later great house of Pueblo Pintado. The first cluster, located just north of the great house, includes one exceptionally large roomblock more than 50 meters long, accompanied by a trash midden that is also unusually large. Based on the temper of early ceramics in this cluster, the people appear to have come from the Mesa Verde region to the north, presumably as part of the mass exodus following the collapse of the Dolores villages in the late ninth century. The second cluster, 3 km west of the first one, appears to have also been founded around AD 875 but continued in use well into the Pueblo II period. The ceramics are quite unusual in manufacture for the Chaco area and indicate origins to the south in the Mt. Taylor area. Interestingly, the roomblocks in this cluster were aligned along the road connecting the Pueblo Pintado community to the core area of Chaco Canyon, implying that this road may date to the late Pueblo I period. Moving west, the next major cluster of Pueblo I sites is what is known as the Chaco East community, which also featured a later great house. This area also appears to have been unoccupied until about AD 875, when it was colonized by a group occupying small residential sites, possibly only seasonally. In the 900s the community grew considerably, and initial construction of the great house may date to this period, although it’s impossible to tell for sure without excavation. Fajada Gap, at the eastern end of the main concentration of sites in Chaco during Pueblo II, is one of the areas where early surveys indicated a dense Pueblo I occupation which Windes disputes based on current understandings of the ceramic chronology. In fact, while there was unquestionably a small occupation of the area throughout Pueblo I involving scattered hamlets, this appears to be yet another part of the canyon where there was an influx of people in the late 800s who established the basis for the community that developed subsequently. There are two great houses in this community, Una Vida and Kin Nahasbas, both of which were constructed beginning in the late ninth century. Many of the potsherds from the South Fork community were tempered with chalcedonic sandstone, which is typical of sites to the south near the modern community of Thoreau. There is also an unusually high abundance of yellow-spotted chert among the chipped stone assemblage, again indicating connections to the south. This type of chert occurs in the Zuni Mountains near Thoreau and is common in sites in that area. Although this was the largest Pueblo I community in the Chaco area, it appears to have been very short-lived, with little trash accumulation. This suggests that the Pueblo I period was a dynamic time of extensive population movements in this area just as it was in the better-understood areas to the north. The subsequent Pueblo II occupation of the South Fork was much more extensive than the Pueblo I occupation and quite different, with sites dispersed up and down the valley rather than clustered in one area. A similar though somewhat smaller cluster of sites dating to the Pueblo I period was also present in the upper reaches of Kin Klizhin Wash to the west of Fajada Wash. Returning to the main canyon, there were a few scattered Pueblo I hamlets between Fajada Gap and South Gap, but the occupation doesn’t seem to have been extensive. Even in South Gap itself, an area of considerable density during Pueblo II and the location of the cluster of great houses known as “Downtown Chaco,” Pueblo I occupation was sparse, with a few scattered sites in the gap. Apparently the only Pueblo I site known in this part of the canyon proper is Pueblo Bonito, where the earliest construction of the great house, known as “Old Bonito,” dates to the mid-800s (or possibly even earlier) and there is also an earlier pit structure excavated by Neil Judd in the 1920s. Judd thought the pit structure reflected an earlier occupation unrelated to the great house, but with improved dating showing that the great house was begun earlier than had been thought the idea of continuity is beginning to seem more likely. There is no evidence for Pueblo I occupation between South Gap and the mouth of the canyon, possibly on account of flooding creating an intermittent lake on the canyon floor. At the mouth of the canyon itself, the Peñasco Blanco great house, begun in the late 800s, sits atop West Mesa, and right next to it is the important Basketmaker III village of 29SJ423. The period between these two important occupations, however, appears to have involved only minor settlement, although there are a few scattered Pueblo I sites. Just west of the mouth of the canyon, however, is Padilla Wash, which had a substantial Pueblo I occupation (possibly even more extensive than current records indicate, since many Pueblo I sites may have been misclassified as Basketmaker III in earlier surveys), another example of the main centers of Pueblo I population in the Chaco core being outside the canyon proper. Windes and Van Dyke note that Peñasco Blanco may have been an important focal point for migration into the canyon from the west and north during late Pueblo I, and that it was likely more important than Pueblo Bonito at this time. As noted above, the Chaco River (formed by the confluence of the Chaco and Escavada Washes at the mouth of Chaco Canyon) was likely one of the main conduits for migrants from the north, but it was much more than that. Pueblo I communities existed all along the Chaco and its tributaries, and some of these communities included early great houses that would have been influential in the development of the great house phenomenon that found its greatest expression in Chaco Canyon in the eleventh century. Windes and Van Dyke discuss a number of these communities, based on field research by Windes to reevaluate areas identified by early surveys as Chacoan outlier communities and to look for evidence of Pueblo I settlement and early great houses. 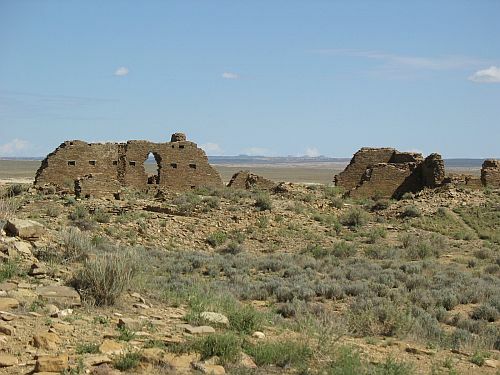 Just west of Padilla Wash is Kin Klizhin Wash, which was the site of extensive Pueblo II occupation but only has a few Pueblo I sites aside from the cluster at its upper reaches mentioned above. There is a late Pueblo I great kiva known as Casa Patricio in the upper part of the drainage, accompanied by a number of late Pueblo I residential sites; it’s not clear from the writeup here what relationship this site cluster has to the earlier Pueblo I cluster. Just downstream from the mouth of Kin Klizhin Wash is the very important early site known as Casa del Rio. While this was initially labeled a large Chacoan great house, reexamination indicated that it is actually a composite of two building stages, both relatively early, with much of the bulk of the structure provided by a Pueblo I roomblock measuring 112 meters in length, with a later masonry great house built over the central portion beginning in the late ninth century. 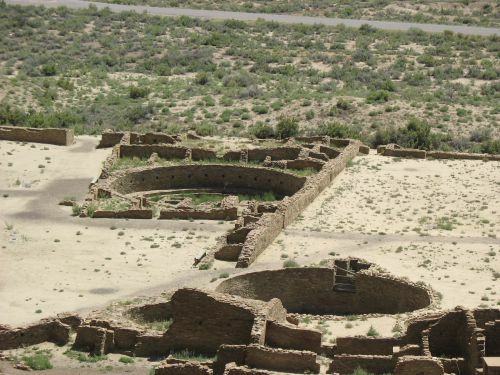 The early roomblock is by far the largest in the Chaco Canyon region, more than twice the length of the earliest construction stage at Pueblo Bonito, and it is estimated to have housed about 16 households or 88 residents. 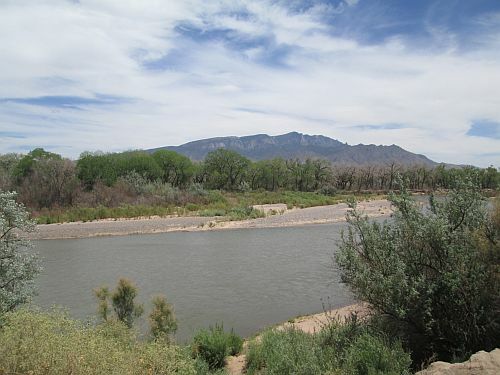 Windes and Van Dyke describe it as “reminiscent of those north of the San Juan River,” although again it is not clear what specific characteristics this refers to. A large number of food preparation tools were found in the area, although other residential sites are scarce. This was clearly an important site during the Pueblo I period which may have played a key role in attracting migrants to the area. One of the most important tributary drainages of the Chaco River is Kim-me-ni-oli Wash, which extends from the Dutton Plateau north past the current site of Crownpoint. The drainage of this wash includes several great houses and extensive Pueblo settlement, and it likely served as an important conduit between Chaco Canyon and areas to the south and southwest. The extent of Pueblo I occupation, however, seems to be unclear. Windes and Van Dyke mention large circular structures near the Bee Burrow great house that resemble Pueblo I great kivas, as well as small Pueblo I roomblocks in the same general area. The area around the Kin Ya’a great house at the upper end of the drainage appears to not have any Pueblo I occupation based on existing survey data, although there is a large Basketmaker III-Pueblo I site just west of Crownpoint and one arc-shaped roomblock near Kin Ya’a recorded as dating to Basketmaker III looks a lot more like a Pueblo I site. At Kin Bineola, site of a major great house dating to the early 900s or possibly slightlier earlier, there is a very small Pueblo I occupation that increased substantially after AD 875 as in many other parts of the region. Further down the Chaco drainage, the Willow Canyon area is unusual in showing evidence of both middle and late Pueblo I occupation in close proximity. The middle Pueblo I community consists of eight sites that show the typical “scattered hamlet” settlement pattern, while the eleven late Pueblo I sites are tightly clustered and associated with a large amount of refuse, leading the authors to interpret this as “a large group” that immigrated into the valley together. These sites show unusual amounts of Type I masonry, associated with later great house construction, although the authors declare that there is no “obvious” great house. It’s not clear what definition of “great house” they are using here, as one site in particular (known as the “House of the Weaver”) shows not only Type I masonry but a prominent mesa-top location with a broad view of the surrounding area, another common characteristic of later great houses. Another community south of Willow Canyon near the later Whirlwind great house also shows a similar pattern but has less information available. The Great Bend area, where the Chaco River turns from flowing west to flowing north toward the San Juan, also shows this pattern. The possible use of the river as a corridor for populations migrating from the north after the collapse of the Dolores villages makes this potentially an important area for understanding regional prehistory. The eastern flanks of the Chuska Mountains, which parallel the north-flowing segment of the Chaco River and form the western side of its drainage basin, are also important for understanding Pueblo I settlement but are poorly known. The general pattern seems to be the same as elsewhere in the Chaco Basin, with a scattered occupation in early and middle Pueblo I that sees a huge increase, presumably from immigration, in late Pueblo I after AD 875, but due to depositional factors it’s likely that the earlier Pueblo I occupation has been underestimated. A few sites dating to this period have been excavated through salvage projects. Late Pueblo I sites are more common and seem to provide more evidence for the use of the river as a corridor from the north. The largest concentrations are in the Skunk Springs and Newcomb areas, both of which would become major Chacoan outlier communities in Pueblo II. At Newcomb, at least, there seems to be some evidence of a preexisting Pueblo I occupation. It’s not clear if there is any similar evidence at Skunk Springs, where the earliest stage of construction on the great house seems to date to late Pueblo I. Given the importance of Chuskan imports to Chaco at its peak, more research on the background of these communities would be helpful in understanding Chaco’s origins. The Red Mesa Valley is the area between the Dutton Plateau on the north and the Zuni Mountains on the south. 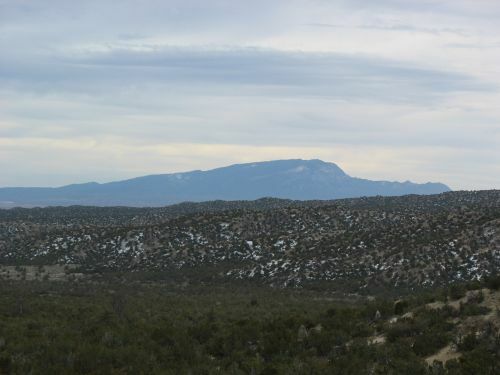 It is topographically rather than hydrologically defined, and straddles the Continental Divide, with the western part drained by the Rio Puerco of the West and the eastern part drained by the Rio San Jose. This means it falls outside of the “Chaco Basin” as hydrologically defined, of course, but its culture history means that it makes sense to include it with areas to the north for purposes of this chapter. This valley was presumably an important travel corridor prehistorically, as it certainly was historically with the railroad and Route 66 running through it and remains today with Interstate 40. This area has been the main focus of Van Dyke’s research, and it is clear that she rather than Windes is responsible for most of this section of the chapter. The same issues of ceramic identification as in the Chaco Basin make understanding the Pueblo I sequence here difficult, but the same basic pattern appears to apply as further north. Early in Pueblo I there was a small, scattered occupation, exemplified by a site on the mesa above the later Chacoan outlier community of Casamero. This site consists of at least two arcs of surface rooms fronted by five to seven pit structures, and resembles White Mound Village further west along the Puerco, which was excavated by Harold Gladwin in the 1940s and dates to the late 700s and early 800s. Another site like this from the same period was excavated near Manuelito during the construction of I-40 in 1961. This sparse population expanded immensely in late Pueblo, when many of the later Chacoan great house communities were founded. Some of the earliest great house construction in the region took place in these communities, which Van Dyke has elsewhere used to argue that great houses were not initially associated particularly with Chaco Canyon specifically. The huge increase in population at this time seems to indicate immigration, but this chapter doesn’t address the issue of where the people in this area might have come from. Given the similarities to the communities to the north in the Chaco Basin, that seems like an obvious point of origin (with earlier origins probably further north in the Mesa Verde region), but developments to the south are poorly understood and can’t be ruled out as important factors. As noted above, some of the immigrants to Chaco Canyon and its surrounding area appear to have come from the south rather than the north, and southern origins would presumably be even more likely for the Red Mesa Valley populations given their location. The fact that the influx here appears to happen at the same time as the northern one is an interesting complication, however. This area, stretching from the area south of Chaco Canyon across the Continental Divide to the Rio Puerco Valley of the East, shows very little evidence for Pueblo I occupation. Today this is a very sparsely populated area used mainly for cattle ranching, primarily on private land, so there has been little archaeological survey, but what survey has been done shows very little prehistoric occupation at all. Only two exceptions are noted by Windes and Van Dyke. One is a recently discovered Pueblo I community southeast of Mt. Taylor, about which little is known. Detailed information from the survey that identified this community is apparently not going to be released. It’s not clear from the brief writeup if this has anything to do with the fact that the survey was for proposed uranium mining. The other exception is the Puerco Valley of the East, around the later Chacoan outlier of Guadalupe. Here, survey by Eastern New Mexico University in the 1970s identified a “modest but scattered” Pueblo I occupation, which increased substantially in late Pueblo I and Pueblo II, culminating in the Guadalupe community with its apparently close connections to Chaco Canyon. Windes and Van Dyke note that the Puerco may have served as an important conduit connecting the Chaco Basin to areas further east, although it remains poorly understood. The eastern associations of Chaco are poorly understood in general, and this appears to be the case as much for Pueblo I as for Pueblo II. After going through the detailed geographical summaries, the authors briefly address some region-wide issues important for understanding the patterns they describe. 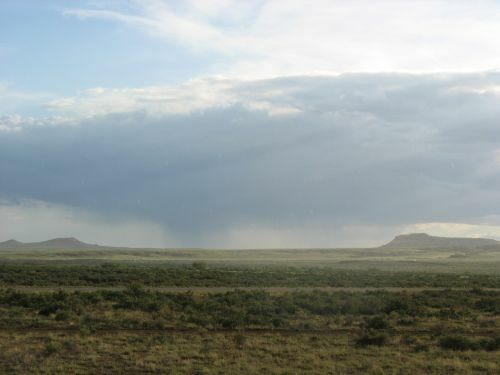 They acknowledge environmental factors as probably important in understanding population shifts, pointing in particular to an apparent “spike” in rainfall in the immediate area of Chaco Canyon between AD 885 and 905 that might have served as a “pull” factor bringing people in from other areas. Conditions in the Chuskas and Red Mesa Valley appear to have been generally unfavorable during this period in which they, too, saw significant immigration, so clearly rainfall totals weren’t the only factor. They also discuss violence, noting that there is very little evidence for it in this region, particularly in the central Chaco Basin, during Pueblo I, especially compared to areas further north where burned structures are common. There are more burned structures in the Chuskas and near Mount Taylor, on the edges of this region, however, and it is possible that the lack of them in the central basin relates more to the lack of construction wood than to any lack of violence. The authors suggest that, given the known evidence for strife and community abandonment in the Mesa Verde region, one attraction of the Chaco Basin might have been its relative emptiness, which may have drawn people into this much harsher and less fertile region. There’s a general tendency for settlement to cluster around drainages and particularly at confluences of drainages, likely because these locations offered the best agricultural potential in a very dry area even by Southwestern standards. Regardless of what it was that initially drew people into this area, it’s becoming increasingly clear that this influx of population was a key factor in the later rise of Chaco. The authors also discuss visibility and sacred geography, which has been a key concern of Van Dyke’s in her previous work. Many of the prominent community buildings in late Pueblo I sites in this region, whether or not they can be considered “great houses,” are situated in locations where important regional landmarks can easily be seen. This indicates that the concern with visibility associated with later Chacoan great houses likely had its roots in this period. Finally, the authors summarize community settlement patterns in the region. 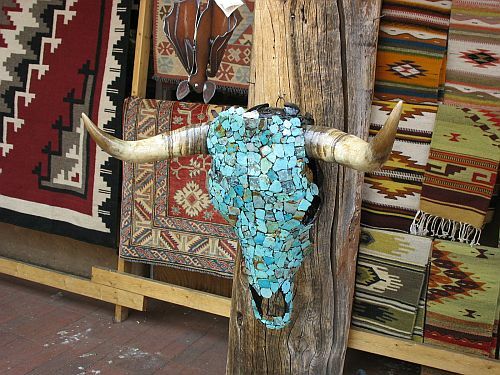 One interesting pattern they note is that in late Pueblo I communities great houses and great kivas don’t tend to occur together, with great houses being more common in the Chaco Basin and great kivas in the Red Mesa Valley. This suggests that two different community integration systems may have been in place in the region during this time. The great house pattern at more northerly sites is interesting in the context of the “proto-great-houses” apparently present at some Dolores area communities further north, especially McPhee Village, and it’s quite likely that there is a direct connection between the two. Great kivas are also common further south, and while they were present at some Mesa Verde Pueblo I sites they weren’t very common. This suggests that at least some of the Red Mesa Valley late Pueblo I communities were in fact settled by immigrants from the south rather than from the Chaco Basin. Some of the earliest communities showing both features were in Chaco Canyon, and it may well be that one factor in the rise of Chaco was the ability of emerging elites there to combine the two traditions into a new social and ideological system, one that would spread far and wide, remaking the course of Southwestern prehistory. The fourth chapter of Crucible of Pueblos discusses the eastern portion of the Mesa Verde region, essentially the northern portion of the watershed of the San Juan River from the La Plata drainage east to the San Juan headwaters. This area has seen less research than some other parts of the Southwest, but several major salvage projects in recent decades have added a lot of data on Pueblo I period settlement in particular. The most important of these has been the Animas-La Plata Project associated with the inundation of Ridges Basin to create Lake Nighthorse south of Durango. These projects haven’t revolutionized our understanding of the Pueblo I period the way the Dolores Project did in the Central Mesa Verde region in the 1980s, but they have added large bodies of systematically collected data to broaden our understanding of the period. The picture that emerges from this evidence shows the Pueblo I period to have been a dynamic, complex time in this region. Indeed, in some respects “chaotic” might be an appropriate descriptor. Population movement, both within the region and between it and other regions nearby, was frequent, sites were short-lived, and evidence for violence is abundant. The population fluctuated wildly but was never very large compared to other areas, but even this small population seems to have been culturally and perhaps ethnically diverse, which may have contributed to the instability and violence. Some of the earliest aggregated villages in the northern Southwest arose in this region during the eighth century AD, but they all appear to have been highly unstable: none lasted more than a few decades, and most appear to have met violent ends. Perhaps relatedly, these villages never held more than a small portion of the overall regional population, in contrast to early villages in some other regions. 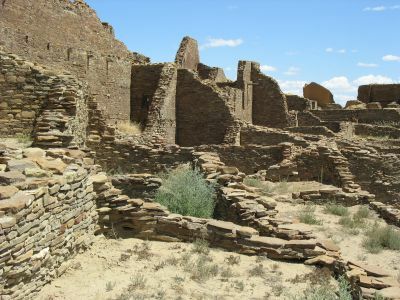 By the end of the Pueblo I period around AD 900 most parts of the region were largely depopulated, with the residents apparently moving primarily to the south, where many of them likely ended up at Chaco Canyon and were involved in the rise of the Chaco Phenomenon over the course of the tenth and early eleventh centuries. The authors of this chapter divide their region into four “districts”: La Plata, Durango, Piedra, and Navajo Reservoir/Fruitland. While showing similarities in material culture suggesting connections with each other, the districts have markedly different demographic trajectories, and it seems clear that there was significant population movement among them over the course of the Pueblo I period. Despite an earlier Basketmaker II occupation, Basketmaker III period settlement was limited to nonexistent in most of the districts, implying that the Pueblo I occupation was primarily the result of migration into the region. Only the La Plata district shows clear evidence for a small BMIII occupation, and even this is probably too small to account on its own for the larger population in the district during Pueblo I. It appears, then, that beginning in the AD 720s there was a migration of people into the La Plata and Durango districts, probably from the south. Site densities increased markedly around 750, especially around Durango, suggesting a further wave of migration, again from the south. It was at this time that the earliest villages began to develop in these areas, although most of the population continued to live in widely scattered hamlets and individual residences. 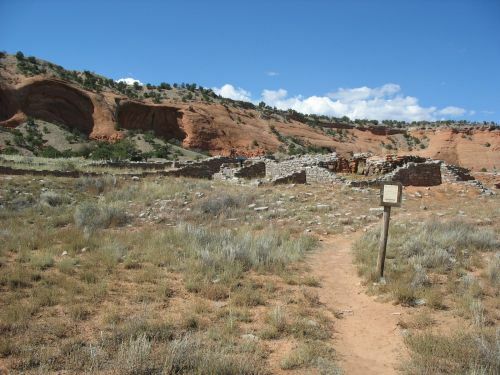 These villages were short-lived and seem to have collapsed in the early 800s, in some cases with evidence for intense violence including, at Sacred Ridge in Ridges Basin, the earliest evidence for the sort of “extreme processing” (probably including cannibalism) of human remains that would recur periodically in later periods of Pueblo prehistory. The collapse of the early villages in the Durango district appears to have coincided with a general depopulation of that district, with residents emigrating in multiple directions. Some went west and appear to have contributed to the rise of large villages in the Central Mesa Verde region, particularly in the Dolores area, where one large and well-documented community, Grass Mesa Village, shows evidence in its material culture for strong ties to the east. 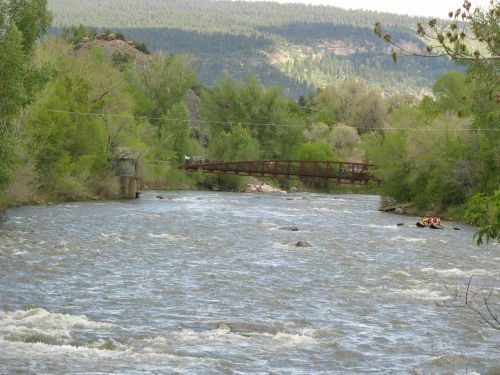 Other Durango people may have gone south into the Frances Mesa area in the lower Animas River valley, possibly mixing with other groups migrating north at the same time. This occupation was short-lived and may have ended with the people moving north into the Dolores area to join the villages there. Some Durango people may also have gone east to form the first Pueblo I occupation in the Piedra district, although this area has seen less research than others and the picture isn’t as clear. Recent surveys do suggest that the Piedra was somewhat marginal to developments elsewhere in the region during Pueblo I, and that its population was both smaller than had been thought and mostly limited to the late Pueblo I period. The fate of the La Plata population is less clear, but there is a definite decline in site numbers after AD 800 coinciding with an increased number of sites in the Mancos River drainage to the west, suggesting emigration to the west there as well. As it turned out, the Dolores villages weren’t very stable either, and after their collapse in the mid- to late ninth century people seem to have migrated back into the eastern Mesa Verde region. A surge of immigration into the Fruitland/Navajo Reservoir district after about 880 contributed to the highest regional population of the whole Pueblo I period, although it still wasn’t very high (3,000 people at most regionwide, and likely more like 2,000). The Piedra district also saw a considerable increase in population at this time. The Fruitland/Navajo Reservoir occupation was short-lived, with more evidence of violent ends for some village sites, and it seems that most or all of the people moved south, with at least some of them joining the growing communities in and around Chaco Canyon. There may have been some migration south from the Piedra district as well, but it continued to be occupied into the Pueblo II period after 900. The Piedra people seem to have been somewhat isolated from developments elsewhere in the Pueblo world during early Pueblo II, which is unsurprising given that they were left quite isolated geographically by the depopulation of the Animas drainage and Navajo Reservoir area. They don’t seem to have been completely cut off, however, and ongoing contact with Chaco in particular is suggested by the development of the Chimney Rock great house with its remarkable astronomical alignments in the eleventh century. There are several noteworthy characteristics of this pattern of settlement and migration, which the authors of this chapter point out. One is the obvious importance of population movement, versus natural increase or decrease, in explaining the wild demographic swings both in the region as a whole and among its individual districts during this period. It was a very dynamic period, when people rarely lived in the same place for more than two or three generations. It’s not clear entirely why, but one reason is likely linked to one of the other noteworthy characteristics: widespread violence, including some of the most extreme violent incidents in the whole archaeological record of the Southwest. Interestingly, much of this violence, including the “extreme processing” incident at Sacred Ridge, appears to have been linked to internal conflicts within communities, especially the early villages. This may in turn explain why relatively few people in this region lived in villages, although it still leaves open the question of why anyone did. The authors suggest that one factor may have been the perception of safety in numbers in a chaotic era, although this ultimately proved to be illusory. It’s not clear to what extent warfare between communities was actually occurring, however, and the widespread popularity of a scattered settlement pattern suggests it may not have been that major a concern for most people. On the other hand, palisades around individual residents units are fairly common in the region, so it may be primarily a matter of different strategies for dealing with violence. One other noteworthy thing about the violence is that the “extreme processing” phenomenon appears to have been exclusive to the eastern Mesa Verde region during this period. This is interesting because in later periods it occurs in other regions, most notably in the Central Mesa Verde region during the mid-twelfth century, where it is possibly associated with the collapse of the Chaco system. There has been much dispute and discussion about the occurrence of cannibalism as part of at least some of these assemblages, which I’ve discussed at length before. 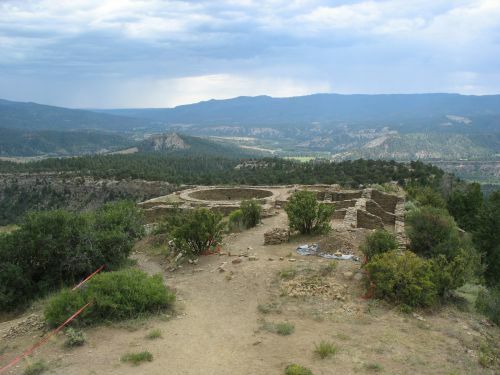 The fact that it appears earliest in the eastern Mesa Verde region during Pueblo I, when it appears to be limited to that region, adds an important piece of context for understanding the phenomenon. While the occurrence of ritual cannibalism in Mesoamerica has led some to look there for the roots of cannibalism in the Southwest, there are some important differences in the apparent practices behind the assemblages that make a Mesoamerican source difficult to document, and if the eastern Mesa Verde region was in fact the part of the Southwest where these practices originated that makes the Mesoamerican connection even more tenuous. While the exact connections between specific Basketmaker and Pueblo populations in different areas are hard to pin down, it’s generally thought that the eastern Basketmakers were both ancestral to later Pueblo populations in the same areas and descended from earlier Archaic populations. Importantly, these eastern groups generally show much less evidence for Mesoamerican influence than western groups, among whom “extreme processing” events are both much rarer and, when they do occur, much later than in the east. Obviously it’s not that there was no Mesoamerican influence among eastern groups, since they did have maize agriculture and so forth, but there’s much less evidence for specific, direct influence than in the west. This implies that “extreme processing,” including cannibalism, may actually have been a practice that developed indigenously in the eastern Mesa Verde region and spread to other parts of the northern Southwest as part of the widespread population movements following Pueblo I. 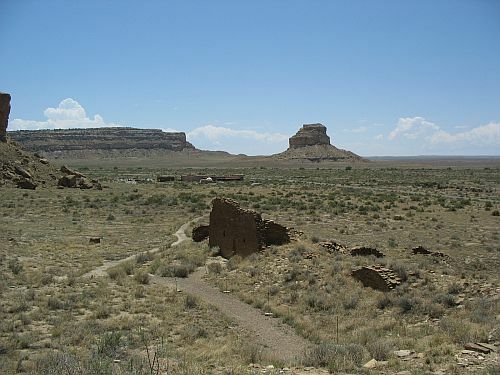 Finally, the violent and chaotic nature of the Pueblo I period in the eastern Mesa Verde region, whatever the underlying reasons for it, adds some context for the attractiveness of new social formations in other regions, such as the Pueblo I villages in the Dolores area and the emerging great-house communities of early Pueblo II in and around Chaco. While the Dolores villages were not ultimately able to deliver the kind of peace and stability that immigrants from the eastern Mesa Verde region may have been looking for, Chaco apparently was. 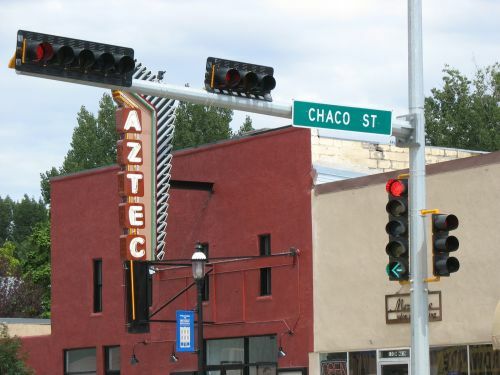 Furthermore, once Chaco rose to regional prominence in the eleventh century it was able to extend that peace and stability over an unprecedentedly large area of the northern Southwest, including the eastern Mesa Verde region itself. Understanding how the system that emerged in Chaco Canyon was able to achieve this remarkable feat when no one had succeeded at anything like it before is one of the most important questions in Southwestern prehistory, and it is still very much an unanswered one. One important piece of the puzzle, however, is clearly the Pueblo I context in the Chaco area itself, and it is to this that we now turn.